As many of you know I’ve been tinkering lately with some new tiny computers. One of them is the Arduino programmable controller and the other one is the tiny Linux computer called Raspberry Pi. I’ve purchased these from a company called Adafruit.com. And unfortunately I’ve gotten addicted to visiting their website. They have a link called “New Products” and it seems to me like there’s something new there just about every day or at least several times a week. Their founder and CEO with the unusual name Limor Fried (aka “Ladyada”) was recently named Entrepreneur Magazine’s Entrepreneur of the Year 2012. You wouldn’t think a young female MIT grad with bright pink hair and studded jewelry would win such an award or get much attention but the do it yourself market and companies like hers are such a movement it even landed them a feature article in the Washington Post this week. Their latest product is something called “littleBits” as seen here from their product catalog. It’s electronic building kit for kids young and old who want to build gadgets without having to do a bunch of wiring and soldering. Each component is a little circuit board with a connector on each end that snaps together using magnets. You simply lay the blocks end-to-end in a snap together. They even have the magnets polarized in such a way that it won’t let you wire together things that ought not to be wired together. Adafruit.com is just a distributor or reseller. 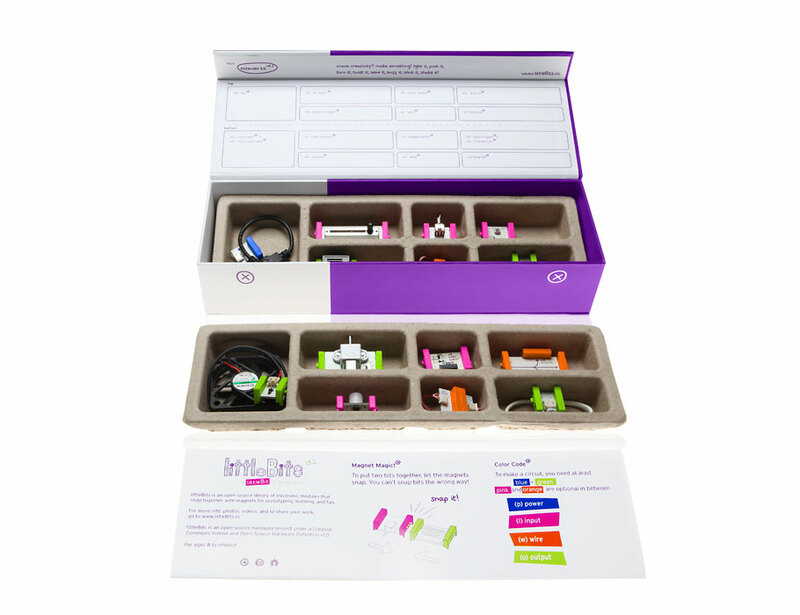 For more information on all of the kits and parts available you can check out littleBits website at http://littlebits.cc/. The whole thing reminded me of electronics building kit I had when I was a kid that had similar blocks that were held together magnetically. You would sit the entire array of blocks on a metal plate that served as a ground plane for the circuit you were building. I couldn’t remember the name of it but after several Google searches found it was called Lectron and was made by Raytheon electronics. It was also marketed under the brand name “Electric Dominoes”. After browsing around that website awhile I concluded I must’ve had their series 3 kit shown here. It contained two transistors, a variety of resistors, capacitors, diodes and a radio tuner block as well as a battery pack and a speaker. You could use it to make blinking lights, and audio oscillator (buzzer) and an AM radio. It was one of the coolest toys I think I ever had. Lectron Series 3 kit like I owned. While googling information about the Lectron kits, I stumbled across a website by some guy who had built his own homemade Lectron blocks. That led me on to a bunch of other websites in one of the other articles showed a guy who had made a homemade Dr. Who sonic screwdriver using an Arduino Pro Mini. They sell one commercially that not only makes sound effects and blinks that can be use as a TV remote. This homemade one does all of that and more. According to the website “Among the various features and functions that this device has are an EMF (electromagnetic field) meter, voltage detector, dog whistle, brown note tone generator, sound level meter, ohm meter, volt meter, and an IR universal remote. It can also serve as a laser pointer or a flashlight and of course there is several settings for making the LED pulse dramatical” Check out the article here. Perhaps after the holidays I will have some time to write some articles here about my own Arduino projects a potential new client I have for their use. Thanks very much for your blog entry on the Lectron! My first experience with the Lectron was the model 820 from Raytheon. The Lectron product remains one of the best pedagogical approaches to learning electronics. The German company that you mentioned that still manufactures and sells the Lectron is Lectron GbmH. Their website (which you can run through Google translate) is http://www.lectron.de. If I can answer any questions about the Lectron, please let me know.